Bradlee is using Smore newsletters to spread the word online. In the 20th century there were a few million African elephants. Now there are an estimated 450,000-700,000 African elephants. Elephants can swim in water. Elephant trunks are 7-10 feet long. They eat grass and their skin is so sensitive that it can a fly landing on it. Elephants have been relentlessly hunted for their tusks. An elephant's skull weighs about 115 pounds. 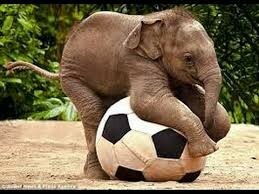 A baby elephant is called a calf. In the zoo, elephants like to role in mud.